← Multiplication Tables as Art?! 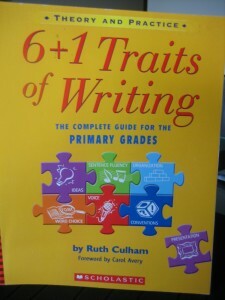 The book 6+1 Traits of Writing by Ruth Culham was one of the first books I bought as a resource for teaching writing. Since then I have found many more resources both print and online to support my teaching of 6+1 Traits. One valuable resource I have been introduced to was created by the Northern Nevada Writing Project, writingfix.com. Writing.fix.com is a resource in which teachers share writing lessons based on the 6 traits. These lessons are techniques designed to help reluctant writers and their teachers. This website is full of effective resources, but one of my favorite parts include the lessons partnered with mentor texts suggestions. Using literature to teach the writing traits allows students to see and hear the trait being used. The students are then connected and tuned it. I recently used a lesson idea for the Ideas Trait from writingfix.com. 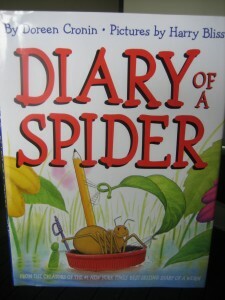 The suggested text was Diary of a Worm by Doreen Cronin, although I found the newer version, Diary of a Spider to use. This is the great part about these lesson ideas, you don’t need to follow them verbatim, you can adapt for your own class. My class and I read the book a few times and discussed the humor the author used to convey facts about spiders. We also talked about how unlikely it is that a spider keeps a diary, which of course led them to think about other funny, unlikely diary keepers. So as the lesson idea stated, the children were then off composing their own diary of an unlikely animal or object. I am sharing two examples here from my third grade students. Diary of a Quarter Writingfix.com is a helpful and effective website when exploring possible ideas for teaching the writing traits. If you haven’t checked it out, I think it would be worth your time to stop by and see for yourself. This entry was posted in Reading, Uncategorized, writing and tagged 6 traits, read aloud, writing. Bookmark the permalink.